Matocha received an offer from Miami today. I hope we don’t have all our eggs in one basket - again. They also offered Legendre of Warren Easton a couple of weeks ago. Miami's OC just spent last year as Alabama's OC and QB Coach. They're scrambling for a QB to serve as a safety net this year...but their signing of Tate Martell makes them a much less desirable landing spot than some might think. If Matocha is serious about getting on the field early, then he's got other options that are better for him. However, if he's just looking for prestige, Miami will be the choice. I really don't think we take a high school QB unless it's Matocha (unless there is a big surprise). We're not going to just take a guy to take him. That's not to say we won't be looking to take a transfer QB (grad or otherwise), but as far as High Schools go, it's probably Matocha or nothing. Fritz was pretty clear he’s not going to reach for the last four spots. Getting shut out now will make us a very good spot for next year’s transfers. Miami has been a dumpster fie at the QB position. Martell has 3 more years there? Unless he's eligible this year, he has 2 years left. So, the QB who replaces him will be at least a RS Jr. if they enroll this year. 8. Any new names that have surfaced? Besides QB, how would you rank what we need? I am thinking OL, DB, and WR. If that is not the order, do we just sign best recruits available and forget biggest needs. 1. We're looking at several O-Line grad transfers as well as a couple of high school seniors. 2. No clue. Not even sure Scott wants to play football at this point judging by his twitter profile. He seems to want to be internet famous. 3. We're in good shape with Hickman. 4. 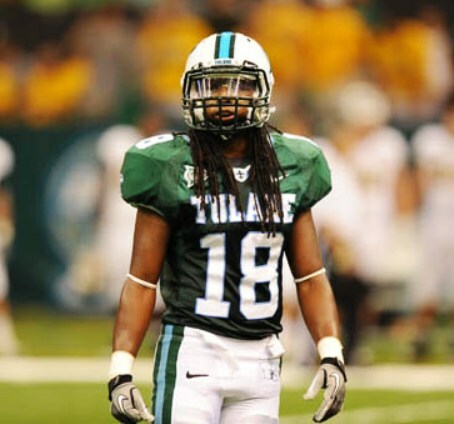 Yarde likes Tulane but hasn't visited yet. 5. Tolbert is only being followed by one coach on twitter. I know 247 lists him as "Warm" to Tulane, but I would seriously doubt it. 6. He took a visit in December and didn't sign anywhere. He seems like a wait and see. 7. Edwards is still looking. I think we're looking elsewhere based on the fact that he didn't sign in December...see Hickman. Kansas has entered the picture for him and they are STARVING for D-1 level players. 8. No new names as of yet but I think this weekend you'll see 3-4 kids visit that haven't been mentioned anywhere. Don't be surprised if we try to fill multiple slots with grad transfers because next year we don't have that many scholarships and would like to be able to sign more in the class of 2020. I don't think we have any real musts left (even at QB). We just need 4 quality players. As always, thanks for the update. And the grad transfer situation is something I never considered. It is a way to keep the numbers balanced from year to year. The only caveat for me is the QB and OL. I want those guys as long as possible to master the “system.” Perhaps in today’s landscape, especially for P5’s, that is neither doable nor desired. Believe it or not, there are two Matocha QBs from Texas. Just want to make sure it is Peyton and not Joe that got the UM offer. As for 2020, if we sign all HS seniors with the 4 slots we'll go into the next recruiting cycle with space for 18 new players in 2020. That's before any attrition, which always happens. No problem. As of right now, if we signed 23 high school players for this class, we'd have 18 slots available for next year before attrition. That would probably put us in the 22 range when you factor in 4 scholarship players likely to leave the program. Looking ahead to 2021, we have only 13 seniors. With attrition, that gives you 17-18. If we sign 2-3 grad transfers in 2020, we'd get that to 20-21. We don't need 25 spots every year, but it would be good to always have at least 20. What I see as good news here is that we are finally getting to where our roster numbers about 85. We were way below that when Coach Fritz arrived, and it has taken him now four years to approach a full roster. He committed to Miami if anyone cares. I doubt he ever sees the field there. Miami has Tate Martell, but also Jarren Williams who was a 4-star and redshirted last year and will likely start this year if Martell doesn't get the waiver he applied for. Also, didn't they just sign like an 'all world' wide receiver ?? FW, you never know. They said the same thing about Ian Book at ND, Baker Mayfield, Gardner Minshew, and even Mr. Drew Brees. This kid can play and even though he played in the Texas private league, the school he goes to in Houston has traditionally excelled in athletics. I hope he gets a fair shot to compete. He'll get a fair shot. He was handpicked by Dan Enos, the new OC/QB Coach, and when they got his commit, they stopped recruiting Lance LeGendre. You're right, you never know.